I wasn't sure if I'd be able to make my husband's birthday pie this year, but I found the time and energy to do it (when the babies were sleeping, of course)! He always picks pie over cake for his birthday, and that's quite okay by me. We are definitely pie people around here. Don't get me wrong, I love a good piece of cake (especially carrot or chocolate), but pie is where it's at. In the past we've had honey-walnut pie, old-fashioned vinegar pie, blueberry pie, and more to celebrate his birthday. This year, I went with a berry pie - a mix of strawberries, blueberries, and raspberries to be exact (blackberries would also be nice). I wanted to make a fruit pie with a summer fruit and berries are a highlight of summer to me. Every bite bursts with fresh summer flavors! This recipe makes one standard 9-inch pie and will make about 8 servings depending on how large or small you cut your slices. Serve with a scoop of vanilla ice cream or a dollop of whipped cream, if desired. But, it's excellent on its own. Roll out one crust and fit into a 9-inch pie plate. Leave the overhang for now. In a medium pot, mix together the berries, sugar, lemon juice, cornstarch, and salt. Heat over medium heat and bring to a boil, stirring often. Reduce to a simmer and cook until the mixture begins to thicken, about 5 minutes. Remove from the heat and let cool slightly. Roll out the second crust and cut it using a sharp knife or pizza cutter into about 1/2-inch strips. Pour the filling into the pie pan. Top with the crust strips in a lattice pattern. Then remove the crust overhang and crimp together the edges. Lightly beat the egg and brush it onto the top of the crust. Bake for about 45-50 minutes, until the crust is lightly golden and the filling is bubbly. Let cool before slicing. Haven't had a pie in ages!! 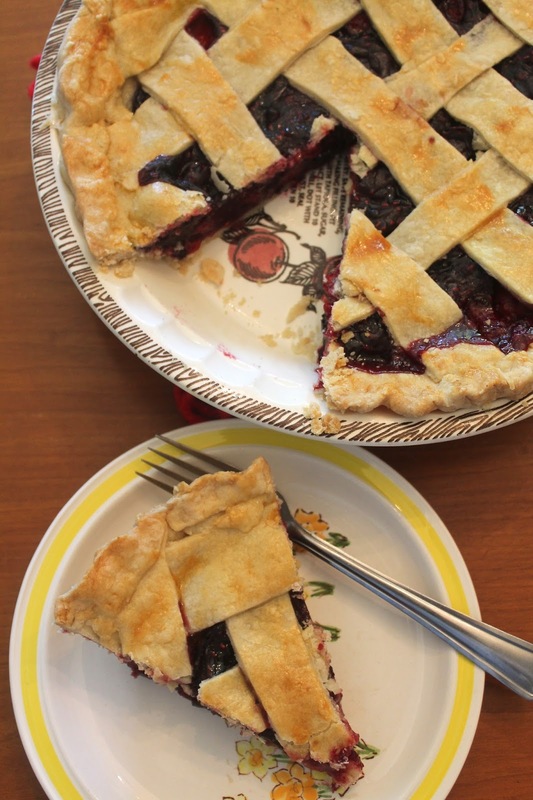 This mixed berry pie looks fantastic, Amy. Can't beat lard in a pie crust! We always make our with lard, too. And love a good berry pie. This looks wonderful! I always like a key lime pie for my birthday. Happy Birthday to your husband! Dear Amy, first of all congratulations on the birth of your twins!!! I am so glad to read that all is well and that you are well!! And you even took time out of your very busy day to bake a lovely birthday pie. I am a pie lover as well and I adore this mixed berry summer pie! It looks fabulous! Sending many hugs your way - take good care of yourself! You're a lady after my own heart! Love mixed berry anything and love pie so this is a match made in heaven. Your pie looks awesome! I wish I could make a proper pie. This looks wonderful and I can see why your husband would pick pie over cake for his birthday. Hope you had a wonderful celebration; I'm sure everyone licked their plates clean! Your pie looks great, Amy and I bet it was a big hit with your hubby! I use lard in pie crust too for a great flaky crust. Have a great weekend! Congratulations on the new additions to your family! You must be one busy mama! Your husband is blessed to have a new mama that bakes pies instead of sleeping when the little ones are sleeping. 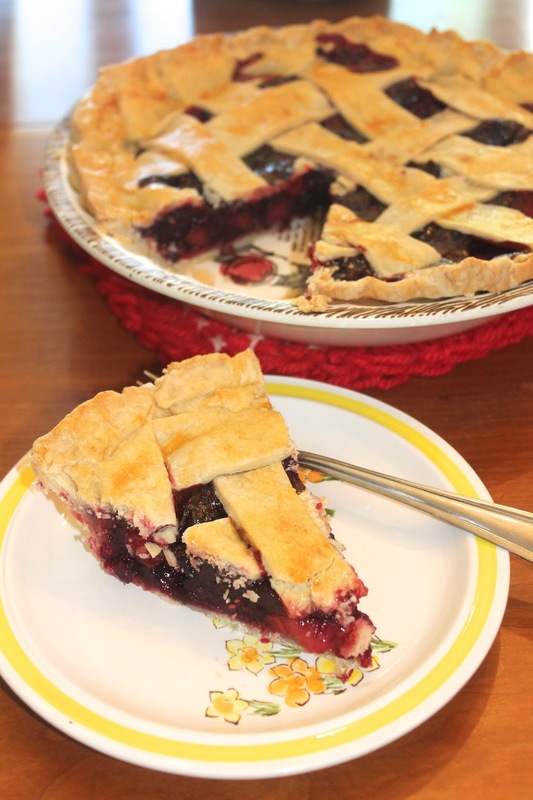 A berry pie sounds perfect and a delightful way to end the summer. With a scoop of vanilla ice cream, this pie sounds like the perfect way to celebrate your husband's birthday. Wow Amy, your pie looks so pretty, and I like the idea of mixed berries...especially topped with ice cream...yum! What a beautiful way to celebrate birthday! Awww, many congratulations on the birth of your twins. I am sure they keep you busy! :) This pie looks so delicious and wonderful Amy. A perfect way to celebrate your husband's birthday. I love the lattice work on the pie. Something I have not yet tried! I love that I don't have to choose just one berry...I get to have them all!! !